Simple is best! These 5-Ingredient Pan Fried Pork Chops come together with about 5 minutes of prep for an easy weeknight dinner that your family will love! Season pork chops liberally on both sides with seasoned salt and pepper. Dredge pork chops in flour, shaking off the excess. Melt 2 tablespoons of butter in a large, heavy skillet over medium-high heat. Add chops to the hot skillet and cook until browned on both sides and a meat thermometer registers 140 degrees F (about 7-10 minutes per side). Smaller bone-in pork chops will cook in 5-6 minutes per side, so just keep an eye on your chops and use the thermometer to know when they’re done. The internal temperature of the pork chops will continue to rise after you remove them from the pan. Transfer pork chops to a plate, tent with foil, and allow to rest for about 5-10 minutes before serving. Note: Depending on the size of your pan (and pork chops), you might need to cook the pork chops in batches of two. Just make sure that you don't overcrowd your pan by trying to squeeze too many chops in at once! Cooking Just for Two? I buy my thick-cut pork chops in packages of 2, so this is a very easy recipe to scale down to serve a smaller family. Just cut the ingredients in half and follow the same cooking instructions. Use thick, bone-in pork chops to keep the meat moist and tender. 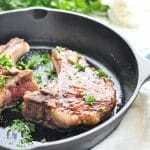 Pan fried thin pork chops or boneless pork chops tend to get dry or tough if slightly overcooked in a skillet. Garnish with fresh parsley or other fresh herbs for a bright, fresh finishing touch. Make pan fried pork chops with apples by frying thinly sliced apples in the same skillet while the pork chops rest. Just add extra butter to the pan and sprinkle sugar over the apples. Sauté until the apples are tender. These Southern Fried Apples would be great with the chops, too! Prepare pan fried pork chops with onions by frying thinly sliced onion in the same skillet while the pork chops rest. Just add extra butter to the pan and sauté the onion over low heat until soft and brown.